BrassCraft's 1/2 In. MIP (3/8 In. FIP) EFV x 1/2 In. FIP x 60 In. 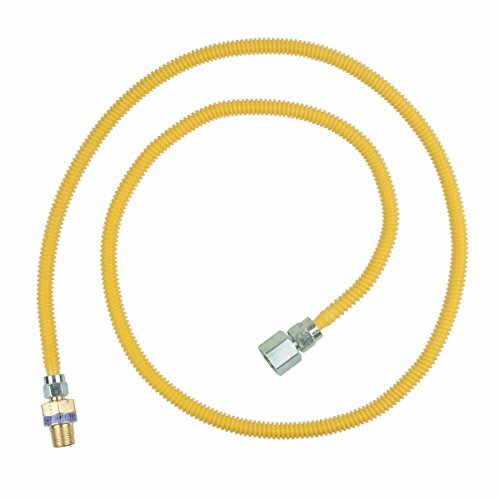 Safety+PLUS Gas Appliance Connector is 3/8 In. OD (1/4 In. ID) with a maximum operating capacity of 24,900 BTU's. This Safety+PLUS gas connector combines excess flow technology with the advanced corrosion resistance of ProCoat, to provide a safer gas connector for home and family. In the event of a gas line rupture or disconnect, the Safety+PLUS valve restricts gas flow at the appliance to a non-hazardous level. This immediate action helps avert the potential for a dangerous release of gas into the home. BrassCraft's stainless steel gas connector is protected with a proprietary polymer coating designed to withstand prolonged exposure to harsh household cleaning, plumbing repair and masonry products. ProCoat coating is applied to the corrugated stainless steel connector using advanced powder-coat technology. Unlike conventional dipped or sprayed coatings, the ProCoat coating is baked directly on the connector surface at high temperatures to provide a uniform coating over the entire length of the connector. The coating is applied only after the connector has been 100% leak tested, prior to nut and fitting assembly. This process results in the most complete corrosion resistance available.